That’s the general scene. 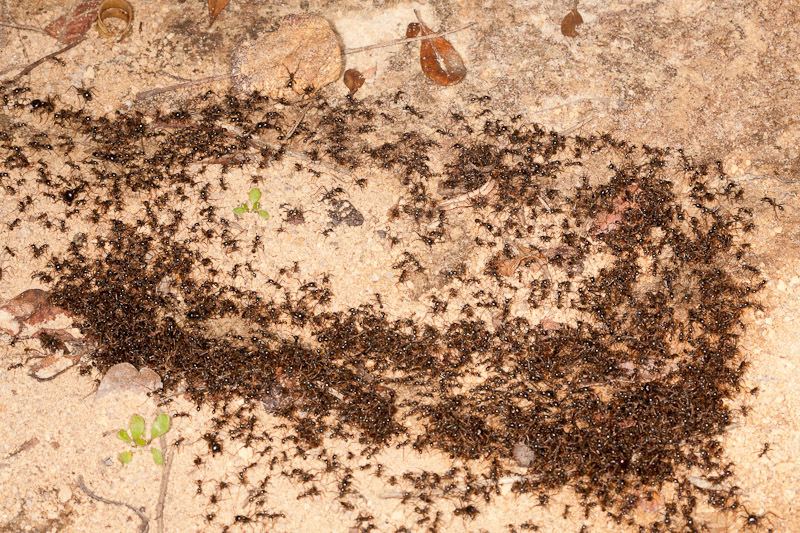 I encountered these army ants on the side of the trail towards the end of the afternoon. The odd thing is that I didn’t see much more than what’s shown here. There were a couple of holes in the ground, outside the shot above, but roughly in the upper left and lower right. Despite some searching in the nearby vicinity, I didn’t find any other ant trails. But there were ants streaming in and out of the two holes, forming roughly two paths. The bottom path was moving to the right and the top to the left. Usually when I encounter army ants, I’m hesitant to get down on my hands and knees and start taking pictures. I’m always afraid they will branch off in my direction while my vision is reduced to what’s in the viewfinder, and the next thing I know I’m covered in them. Having said that, army ants don’t generally give me much pause. Even if they have spread out across the trail, it’s pretty simple to just walk right through them. Like the ants, they are fast moving and difficult to photograph. I’d spot one, but it would then be hard to frame it. I decided to mostly keep the camera trained on one of the holes, wait to spot one approaching, and then try to get a picture of it before it disappeared underground. What you see above is the best shot I managed to get of one. I believe it’s a beetle, a rove beetle perhaps. 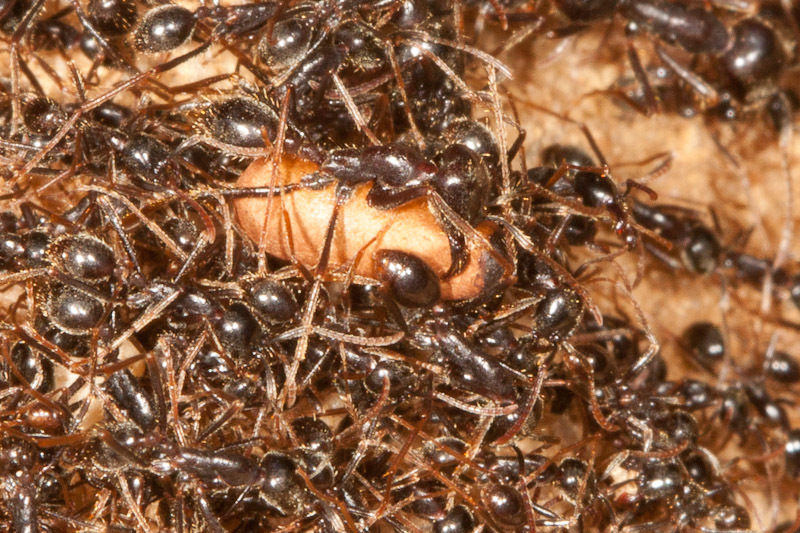 I also occasionally spotted ant pupae being transported. Here’s one of the larger soldier ants. Darkness was approaching, and then something unusual happened. The scene became one of chaos as the paths all but disappeared and instead the ants just sort of carpeted the area. Then, paths became discernible again, but the ants had switched directions! I would have loved to have watched longer, but there just wasn’t enough light so I continued on the path back towards the sanctuary. 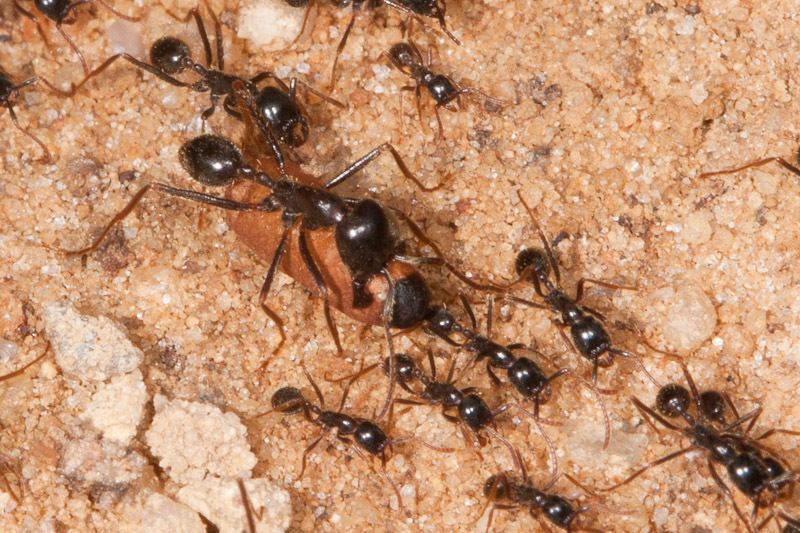 I know that some species of army ants are subterranean, so perhaps these are one of those species. The myrmecophile looks like a rove beetle, perhaps? Skimming again 🙂 That is my guess as well. What an interesting post, and some great pics! I have a picture (not nearly so nice) of some beetles I encountered under some bark in Sam Houston NF that look remarkably similar to the beetle above. 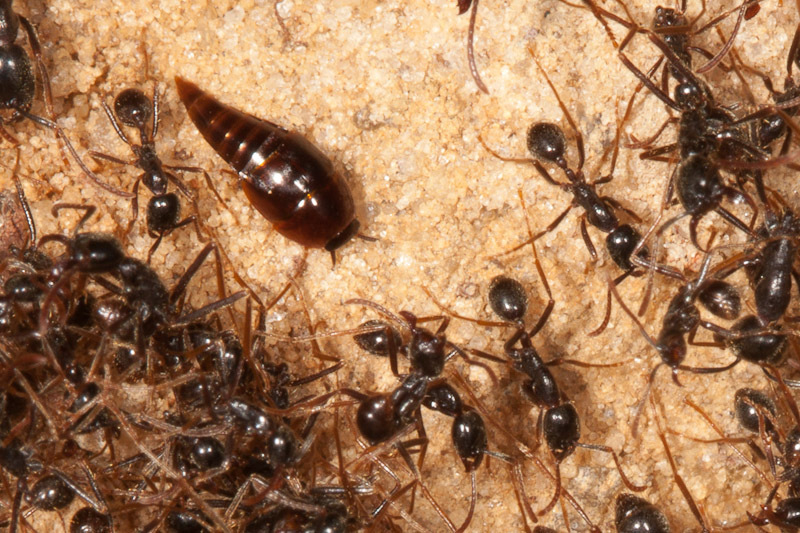 No ants about for these guys. They’re in my collection but I’ve never been particularly good at keying out small beetles so I never got past Staphylinidae. The top picture reminds me of the ‘death spirals’ you hear about (circular milling). Yep, army ants, one of the Labidus spp. Whew, I’d been worried this whole time that I totally missed the mark here. Thanks for that! Was browsing blogs and came across this wonderful picture featuring a species of Vatesus (subfamily: Tachyporinae). Good shot – these things are lightning fast! 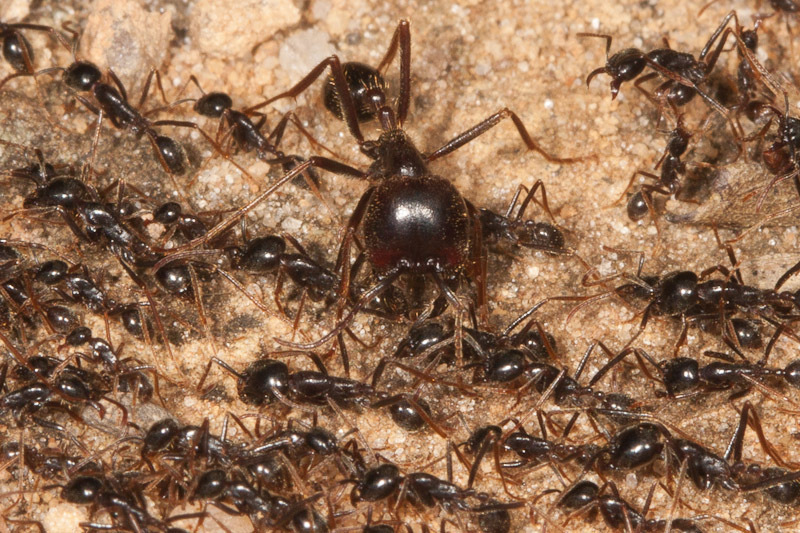 As far as I know, all Vatesus are associated with ‘army ants’ though I rarely see them when I look in columns. Stuff like this breaks up the winter ‘blahs’, thanks! Thanks for the info, Adam! They definitely were fast. I basically prefocused where I knew one would pass, then waited until I saw one approaching. It was definitely hit or miss.